This Key Smart is part of my EDC. About two years ago (maybe a bit more) I tired of the jangle of keys in my pocket, their weight, and from being poked when I sat or moved such that they snagged me through my pocket. After reading about a number of alternative modes for carrying keys (which we all must carry), I purchased an original Key Smart from Amazon. 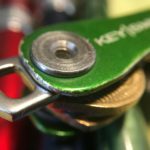 The Key Smart is not the most expensive tool for carrying keys. It is adjustable and can carry more keys than I do (about a half-dozen). Care is required to get the tension right on the screws or you might strip the female end or leave them unsecured, which means you might have a “key explosion.” I read a few reviews that included horror stories of lost keys, which were accompanied by negative reviews and “star” ratings. I believe these are undeserved as they represent user error (or SUE, AKA “Stupid User Error”) and a lack of care and attention to one’s carry kit. I have had no problem with the carrier after making some adjustments to the tension on the retaining screws. After two years of EDC, the anodizing is holding up well. There is a bit of brassing at high-contact points, though. I noticed a few follow-up questions on Amazon a few weeks ago. There was some concern that the “paint” might wear off. 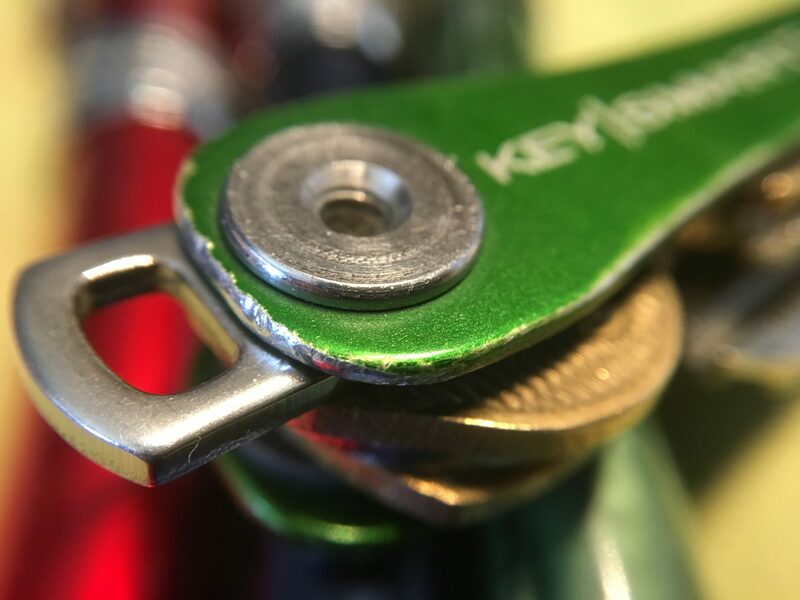 As far as I can tell, my Key Smart is anodized aluminum and has held up quite well. There is some brassing along the edges, which is to be expected for an EDC piece of kit. I don’t think this detracts from the appearance; I think it shows that an item is used and loved. To carry my Key Smart, I purchased an S-Biner (Nitecore, I believe and actually I purchased a multi-unit kit). I hung the unit from a belt loop for awhile, but decided I didn’t like that. It didn’t feel secure. It was “floppy” and banged around a bit when I was active or in a confined space. Therefore, I fashioned a loop from some Coyote Brown paracord, with the loop about eight- or ten-inches in length. 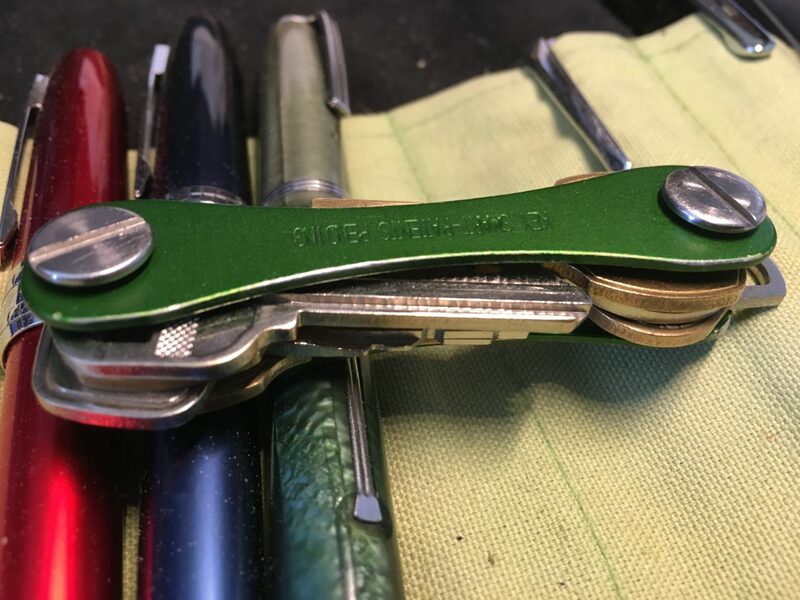 I use a larks head knot over my belt and clip the Key Smart’s S-Biner to the loop, which then hangs in my pocket without touching the bottom of my pocket. The weight is carried on my belt (which is beginning to look like a Bat Belt), there is no wear-and-tear on my pocket, and my keys don’t touch the bottom of my pocket or any of the contents of my pocket. This works for me. I carry all my regular-use keys in the Key Smart with the exception of my 4Runner key. That lives in my second-level EDC kit. I’ll make a photograph of a pocket dump one of these days and post the contents. I might do the second-level EDC kit then, as well as the third-level and my pack kit at some time.